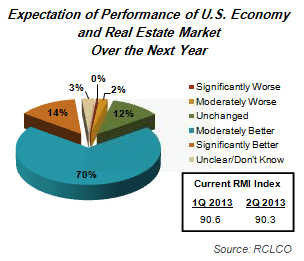 As detailed in Part 1 last week (read it here), respondents to RCLCO’s latest Market Sentiment Survey are feeling slightly less optimistic than they were six months ago, but most still see continued stability in market conditions for the near- to mid-term. Two-thirds (65%) of respondents believe the next U.S. real estate market downturn will not begin until at least 2019, and current sentiment is higher than it was a year ago. As such, respondents predict maturing but stable conditions to continue for at least the next year for most real estate product types. Nonetheless, they remain vigilant about when markets tick over from late stable to early downturn conditions, and how much upside remains. Sentiment suggests apartments and retail may be the first to peak. 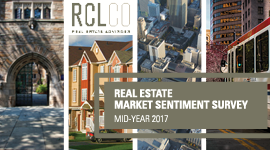 Consistent with the gradual decline in sentiment since RCLCO’s year-end 2016 survey, respondents report most product types are still coasting in the stable phase of the real estate cycle, with few major changes from the sentiment levels reported six months ago. Some land uses, such as office, resort/second home, and age-restricted, inched closer to the late stable phase. Other uses—notably multifamily and for-sale residential—have backed down from the peak slightly. The most prominent change in sentiment was in retail, most likely in part reflecting short- and longer-term concerns about how retail will respond to e-commerce threats. Despite the slow rate of progression of sentiment for most land uses over the past six months, respondents indicate that they believe all land uses will be in the late stable phase within the next 12 months. 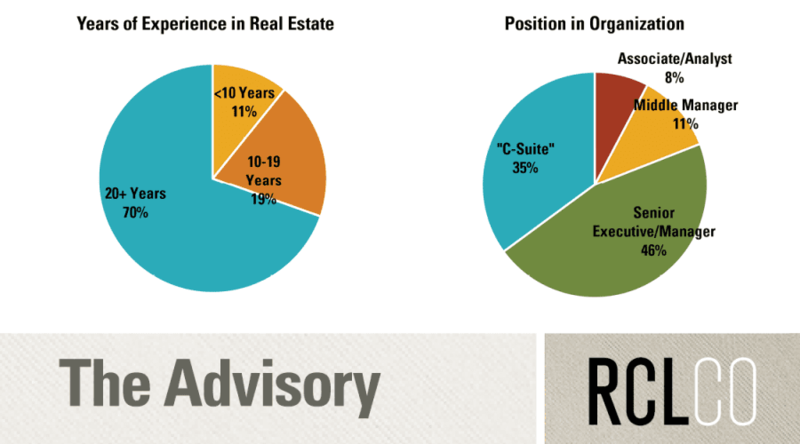 Multifamily and retail uses are expected to be the most mature next year, with both projected to be very close to the peak. Land, hospitality, and for-sale residential are expected to be farther along in the late stable stage as well. Apartments have been the big winner of this real estate cycle. According to RCLCO’s survey, apartments were the first segment to enter the early stable phase of the cycle, all the way back in mid-2012—one year earlier than any of the other segments. The year-end 2016 survey saw a significant increase in negativity from respondents on apartments, with 40% anticipating early downtown conditions within the next 12 months. 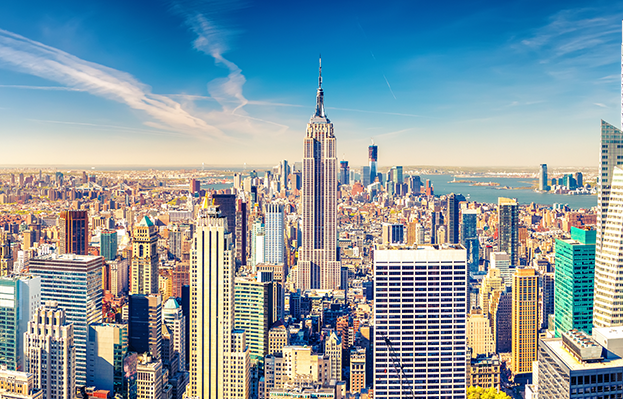 This outlook remains effectively unchanged six months later, with 38% predicting an apartment downturn by midyear 2018. While late stable conditions have continued for longer than some have anticipated, many respondents are still expecting downturn conditions within the mid-term. This cooling moderation of pessimism is reflected in the share of respondents reporting a moderate or significant apartment bubble risk in their market, with 61% indicating some risk. This is down four percentage points from six months ago and is effectively the same as conditions reported a year ago. The share of respondents reporting apartment bubble concerns is strongest in the greater Washington, D.C., area; the Southwest (AZ, NM, NV); and the Southeast (excluding Florida) markets. 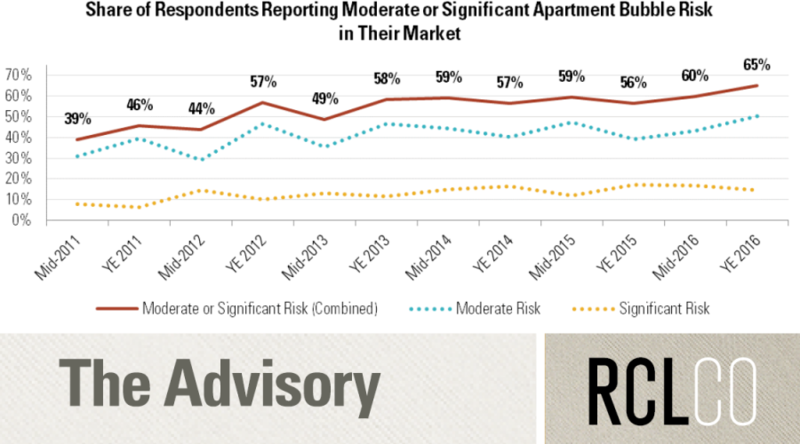 In those regions, at least 65% of respondents say there is a moderate or significant risk of an apartment bubble. Retail experienced the largest swing in sentiment since year-end 2016. Respondents over time have indicated an acceleration in the movement towards early downturn over the past six months. From year-end 2014 to year-end 2016, retail moved slowly through the early stable stage. In the most recent survey, respondents moved retail firmly into the late stable stage, and forecasted that retail will be close to the early downturn stage within 12 months. If these predictions hold, retail would have moved though the late stable stage in half the time it took to move through the early stable phase. This rapid uptick in pessimism is reflected in the share of respondents expecting the downturn in retail to begin in the next 12 months. Almost one-third (31%) of respondents believe that early downturn conditions are likely within 12 months, which is more than a 50% increase in the overall share of respondents compared with six months ago. The share of respondents predicting early downturn conditions this time next year held steady or declined for many land uses, with increases seen in only a few. Overall, those predicting downturn by midyear 2018 are still in the minority for all product types, with the highest share in the rental apartment market. This most pessimistic group did not see their share increase in most land uses, indicating that overall optimism for most product types is in line with where it was six months ago. However, three land uses did see an uptick in the share of respondents anticipating a downturn with the next year: land, retail, and resort/second homes. 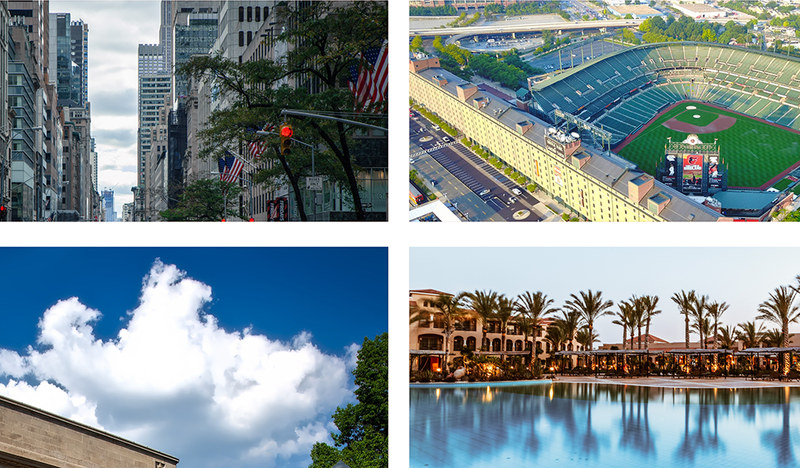 About one in three respondents expect early downturn conditions in land and retail by midyear 2018, while one in four predict the same for resort/second homes. Multiple metrics and indicators suggest that we are in or nearing a “late stable” stage of the market cycle for most property types in most geographies. This is the stage in the cycle where supply begins to catch up with demand, and growth in income and property values begin to moderate. As the late stable phase of the cycle matures, the risk of reaching and passing peak real estate market conditions increases. In fact, multiple property types in some geographies (Washington, D.C.; Houston) and multifamily nationally appear to be near “peak” conditions at this time, though we have no reason to expect a sharp downturn. The RCLCO “base case” scenario for real estate performance assumes these late stable conditions extend beyond 2017, and that the current expansion could continue for another 18 to 24 months, though the probability that unexpected events derail this trajectory continues to be high. 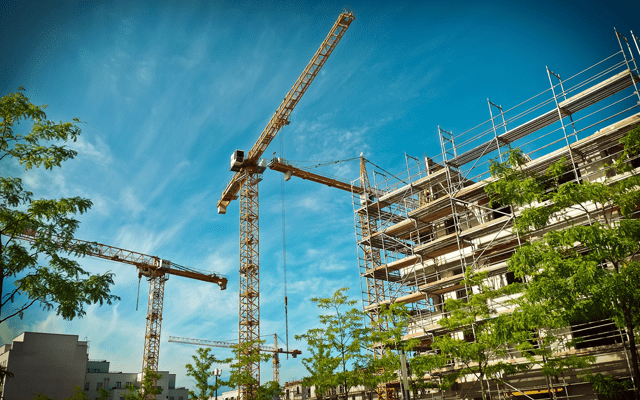 Property Market Fundamentals – Economic and demographic drivers are still increasing demand, though construction activity is catching up in most products and market areas. With inventory at or near equilibrium with demand, operating fundamentals are positive but moderating. At this stage in the cycle, significant increases in rents, occupancy, and prices may be more difficult to achieve. Capital Market Fundamentals – Six months in, the Trump presidency’s policies have had little impact on capital markets for real estate. Conditions are largely unchanged from year-end 2016. Equity – Though still above the long-term average, transaction volume was down in 1Q 2017. We suspect this is a hangover from 4Q 2016, when investors were paralyzed by indecision from the U.S. presidential election, and didn’t focus on underwriting. The amount of capital seeking investments continues to exceed available opportunities, but moderating operating fundamentals appear to be neutralizing pressure on asset prices. Debt – Demand for debt likely exceeds what traditional lenders are willing to supply, particularly for “non-core” investments, and this has created an opportunity for non-traditional capital players to step into the void. Though rates have moderated following 4Q 2016 spikes, upward pressure on interest rates is likely to persist—and the confluence of more expensive debt, higher equity requirements, and cap rate compression could put downward pressure on asset prices. On balance, we anticipate moderating, though still generally positive, operating and investment performance for the duration of 2017 and into 2018, resulting largely from a strong economy and healthy property market fundamentals. Article and research prepared by Charlie Hewlett, Managing Director; Len Bogorad, Managing Director; and Mark Simpson, Senior Associate.